This special retreat is for people with an interest in the trans-formative power of Yoga and the healing energy of water. It is aimed at people of all levels of physical and yoga ability, including those who are not aquatically inclined. For both complete beginners and more advanced students alike, the retreat will be a fascinating exploration of the mind and body. 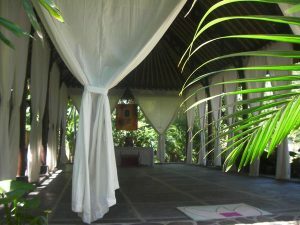 This very special retreat is a journey of self discovery through two related elements, water and air. It’s a journey during which we will re-discover our aquatic heritage and transform our relationship to water, deepening our awareness of our own minds and bodies and the invisible bridge between them, the breath. The tools for this adventure in self-understanding are the ancient insights of yoga and meditation supplemented by the modern techniques of elite free-divers. We will practise yoga asana, pranayama and meditation to come into the subtler aspects of the breath and we’ll use the techniques of elite free-divers to harness our aquatic potential. We will focus on developing aquatic comfort, using water as a healing medium. This is not a competitive free-diving course, the free-diving aspect of the retreat is entirely optional. The breath is the bridge between mind and body, the conscious and the unconscious. To develop control over the mind and body first we must understand and control the breath. Using the know-how of elite free-divers we will also learn how to access the breath in new ways. We will learn about the physiology of the breath and learn how use that to influence the mind and body, along the way transforming our relationship with water. After tuning into the physical breath we shall explore subtler aspects of the breath, with the use of Asana and meditation we’ll tune into the breath as energy and move towards the healing power of Pranayama, the vast science of Pranic energy cultivation . We’ll take our fresh understanding of the breath into the healing medium of water. All terrestrial life was born in the ocean, just as we are born in the waters of our mother’s womb. When we understand our latent aquatic ability and learn to be in water it’s with a sense of home-coming or reunion. It is this sense of inner union that is the essence of yoga. Essentially what we will be practising is a form of oceanic yoga. Daily Asana practice with a focus on fostering a personal practice through self understanding. Breath-work; focusing on developing understanding of the respiratory process and using the breath optimally, using it to influence both the sympathetic and parasympathetic nervous systems. Yoga Nidra; this wonderful technique of guided meditation is a very effective way of communicating with the deep unconscious. We will be using it to effect deep emotional release and create inner states of peace. Mantra meditation; exploration of the deep power of Mantra over the mind and body and in removing emotional blocks. Theory of Tantra and Chakra system; An exploration of the Chakra system with focus on the second Chakras relationship to water. Bhandas; we will train in the three principle psycho-energetic locks of Yoga to develop more conscious control over both the muscular and energy patterns of the body. Pranayama; we will explore the ancient yogic art of energy cultivation through the breath. This is one very powerful path into subtle awareness, meditation and the art of healing with Prana. Instruction in Basic Free-diving; an exploration some of the techniques used by Elite free-divers to develop control of the autonomic system and become more fluid and comfortable in the aquatic element. In Villa Boleh we have a special place to embark on this adventure, a wonderful Spa resort with three different pools, including a therapeutic Watsu pool. Just in front of our sanctuary we have our oceanic playground. Little current, rich waters and good visibility make this the perfect place for to enjoy newly re-discovered aquatic heritage. Also on hand will be the well-respected and highly experienced Thai massage teacher and healer Felicity Keebaugh. She will be offering health assessments and therapeutic treatments in various healing forms including Thai massage and Ki nei san, a very powerful Taoist healing art. 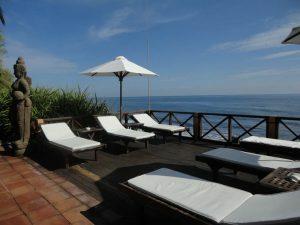 Dates October 15 to 22 Villa Boreh, North Bali. The structure of the retreat will be a in two parts, so that people can sign up for three days or seven days, with an optional two days extra, for deeper free-diving training and a trip to ‘USS Liberty’ shipwreck. In this way those who are stuck for time or unsure if it’s quite for them will be able to do the three days without commiting to the whole retreat. The first three days will be on exploring the link between the breath, yoga asana and energy, with some waterwork focusing mostly on coming into the breath and relaxation. We will use many tools of the incredible existential toolbox that is Yoga, developing fluidity in our mind and body and will then bring that fluidity into the water. All sessions are entirely optional, the combined benefits of all the training will be fantastic but the retreat is aimed all levels and physical abilities. As the timetable is very full, it is understandable that some people will not come to all classes. After all it is a holiday. Aquatic meditation in pool, using water for muscular and emotional release. 15.00 Yoga Nidra; Yoga of the dream state, Use of creative visualisation and Deep Relaxation to access the subconcious and deep unconscious. 16.30 Oceanic meditation. Practicing aquatic mindfulness in the beautiful Bali sea. 17.30 Yoga asana; exploring the qualities of Bramhana(energising) and Langhana(releasing) breath in held asana. Class in Mantra chanting as a tool for coming into the body and calming the mind. 10.30 Discussion of chakra system and relationship of 2nd chakra to Water. 7 Yoga asana; exploration of the character and energy of different Asanas, holding for a bit longer and finding the subtle movement in stillness. 15.00 Yoga Nidra with guided visualisation into the deep. 16.30 Ocean time, snorkelling using breathing techniques of free-Divers to enter into meditative state. The first three days are an gentle exploration of some of the many life tools that yoga and free-diving have to offer the modern seeker. Day four to seven will follow a similar schedule adapting training to suit the individual and group energy levels. On all levels we will go a that bit deeper, adapting our yogic tools to suit individual needs and interests. The focus of our asana practice will be on fostering self understanding to create a personal practice for the student. We will explore the various benefits of different asanas and their energetic character so that asana can become a powerful tool for self balancing and the breaking down of physical or energetic blocks. We will the explore in greater depth the powerful science of Yoga Nidra and use it release deep blocks on the unconscious and subconscious levels. We will also study a little deeper physiology of the breath and techniques of elite free-divers to stimulate the para-sympathetic nervous system and minimise O2 consumption. For anyone who is interested will take our training into the ocean and practice apnea, with an aim towards fostering deep relaxation and aquatic comfort. For those particularly interested in the aquatic side of our practice there is the option of taking an two days training, with the focus mainly on free-diving and then taking a trip to dive the incredible ‘USS Liberty’ ship wreck. Exploring evolutionary history with the MDR. Honing the mammalian dive reflex, MDR training techniques. Our latent aquatic heritage, the mammalian dive reflex.